Oral interview with Bea Goldberg. Interviewed by Irene Dodeck. Bea has been involved with numerous Zionist organizations throughout her life such as Young Judaea and Canadian Hadassah-WIZO. Oral history interview with Ben Garber who was born in 1906 in Miasdkovka, Ukraine. Ben's account discusses his experience with antisemitism and the pogroms (1915-1922) in Eastern Europe. Oral history with Bertha Baron who arrived in Canada 1907 from Minsk, Russia; settled in Rumsey, Alberta. In this interview she discusses her involvement in the Victoria Jewish community and reflects on Zionism. Oral history interview with Cissie Brounstein. 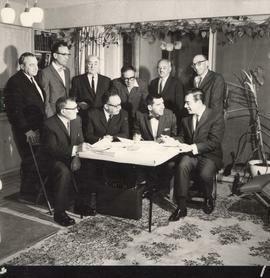 Photograph depicts a group of men posing for photograph; David Nemetz is sitting on the left. Other copies available; refer to PastPerfect for details. Oral history interview with David Nemetz. Oral history interview with David Rome, who was born in Russia. His family emigrated to Vancouver in 1921 by contacting David's uncle.